EOO 18 174 km², between 15 and 20 severely fragmented subpopulations continue to decline due to ongoing habitat loss and degradation, as well as competition from unmanaged alien invasive plants. Clanwilliam to the Cape Peninsula and Agulhas Plain. 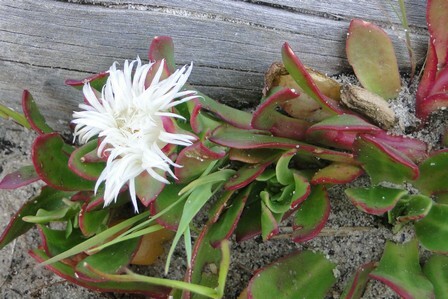 Lowland coastal fynbos, on sandy flats. 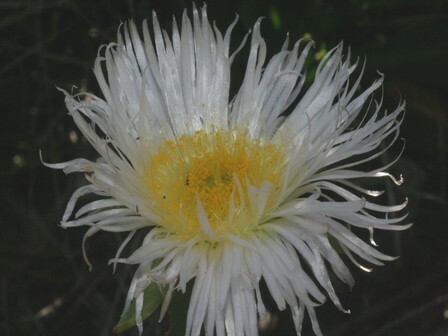 This species has suffered extensive habitat loss to crop cultivation in the Olifants River Valley, the eastern Swartland, Breede and Berg River valleys. Only small remnants of suitable vegetation remains unploughed in these areas, and these continue to be lost and degraded due to ongoing development, spreading alien invasive plants, and inappropriate fire management. 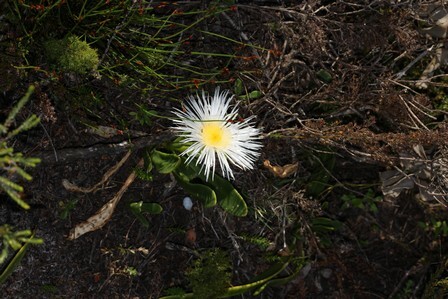 In the Wemmershoek area, Jonkershoek, as well as on the Cape Peninsula, where this species generally occurs in granite fynbos on lower slopes, it has lost extensive habitat to timber plantations, but this threat has largely ceased. 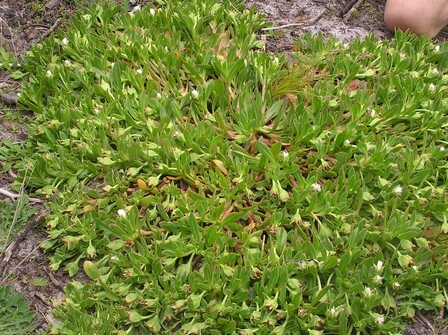 The most severe ongoing threats on the Cape Peninsula are habitat loss to urban expansion and competition from alien invasive plants. 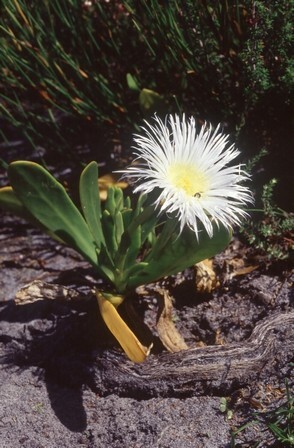 On the Agulhas Plain, much of this species' habitat is severely infested with alien invasive plants, which are outcompeting native species. Skiatophytum skiatophytoides is a formerly widespread and common species that has declined due to extensive loss of its lowland coastal habitat. 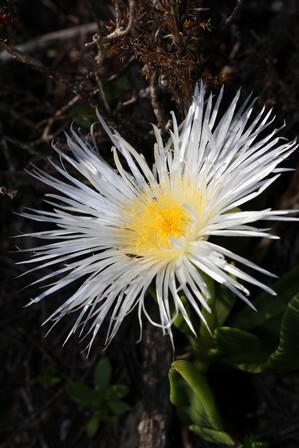 Recent field observations indicate that it is still fairly common in the Berg River Valley north-west of Franschhoek, and on the Agulhas Plain, but subpopulations tend to be small, and are often confined to isolated remnants of natural vegetation. It has been recently recorded at at least 14 locations, and at four of these sites, subpopulations consist of 100 or less mature individuals. 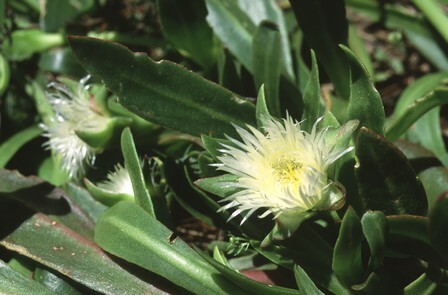 Extant habitat remains at a further eight locations known through historical records, and these still need to be surveyed to determine whether plants survive at these sites or not. Due to extensive habitat loss and fragmentation, the majority of the remaining population occurs in small, isolated subpopulations, and it is therefore considered severely fragmented. The population continues to decline due to ongoing habitat loss and degradation. Klak, C., Hanácek, P. and Bruyns, P.V. 2015. A phylogeny and revised classification for the Apatesieae (Aizoaceae: Ruschioideae) with a comparison of centres of diversity. Taxon 64(3):507-522.